A copy of the application form is shown below for reference only. Biography should contain your training and development as an artist, and why the island inspires the work that you do. Download form, fill it out and mail it to Lynne Jacobsen, 12728 Drayton Road, Anderson Island, WA 98303, or scan it and email it to lynnejacobsen48@gmail.com Mailed form must be postmarked by May 3, 2019. 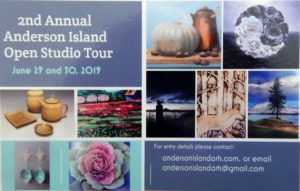 If you have questions contact Lynne Jacobsen, or email island arts.